Alta Residence - The Design Collective Group, Inc. When our clients first invited us to interview for their project at the home they were contemplating to buy, it was clear the residence was in need of help. 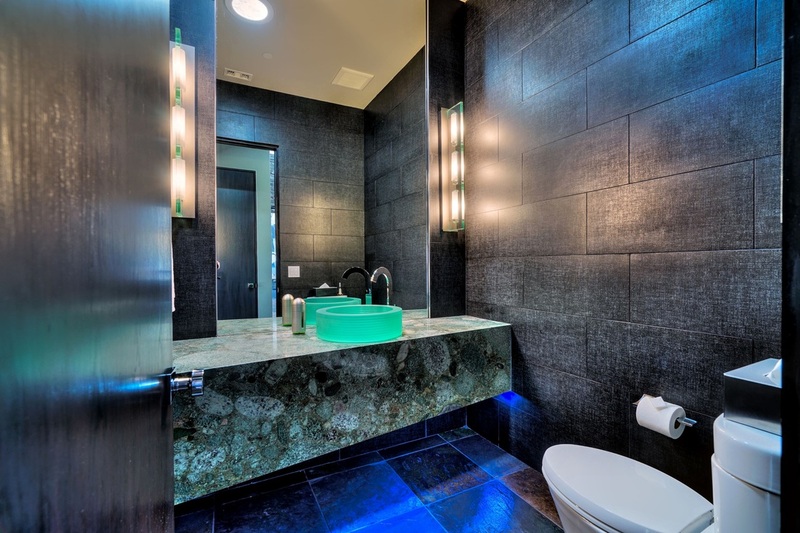 Located in the Alta community in south Palm Springs, CA., the interiors of this 4,200 square foot contemporary residence had great bone structure with wide expanses of windows and sweeping views of the San Jacinto mountains. But the interiors looked more like a stale model home than someone's personal abode. The clients were looking to build a team to transform the place to be a true reflection of their own personal taste. After numerous discussions, designs and deliberations, the results are truly amazing. • The front facing pool and patio features a porcelain tile deck. • The great room connects easily to the exterior with extra large sliding glass door panels. Our design of the great room set the tone for the entire residence,... clean, modern, uncluttered and strong. The existing slate floor was refinished to emphasize color and texture then topped with a glossy finish to add depth and luster. The original fireplace had a typical television arrangement but it was decided to relocate the TV permitting the fireplace to become a strong focal point of gleaming stainless and polished absolute granite. 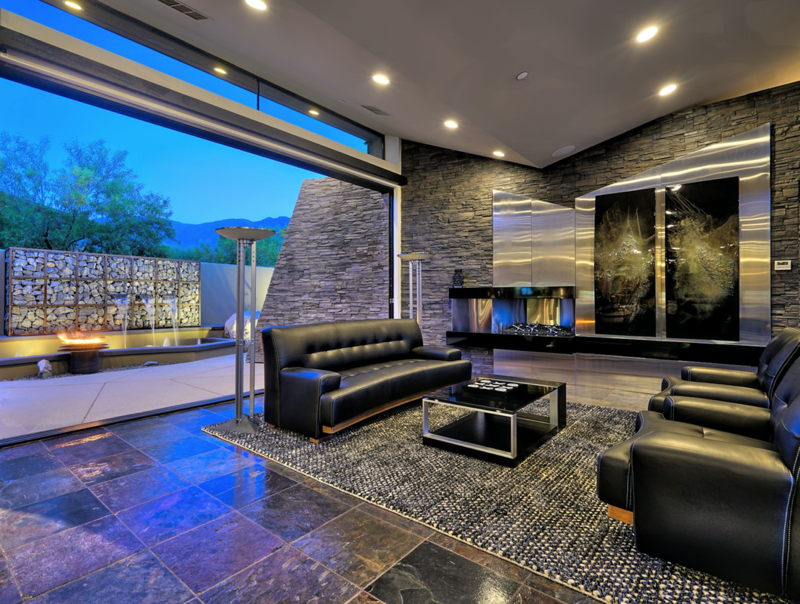 Multiple sets of motorized sliding glass doors can quickly disappear into the walls opening each side of the great room to two individual patios, one with the pool, the other with a unique gabion wall designed to have a water feature and a fire sculpture, the sounds of which are amazing in the desert evening twilight. • Using stainless and granite, the fireplace becomes a strong focal point. 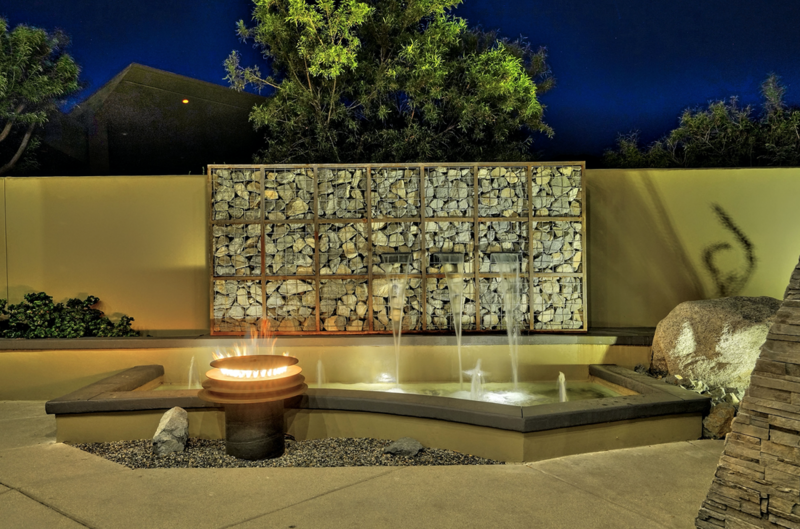 • The gabion wall has both a fire and a water feature. The four bedrooms, all with connecting baths plus the powder bathroom needed their own facelift to complement the strength and sophistication we established in the design of the great room. One bedroom became an efficient home office. A second bedroom was sufficiently large enough that a kitchen wall was added, making the guest room into a full casita for extended stays. A hand-made frosted glass sink in the powder bathroom compliment the stone vanity, LED wall sconces and smoky grey tile wall. And the rear guest bedroom connects to the outside with its own private patio for morning coffee. • The home office has a wall mounted storage unit. • The powder bath has multiple layers of functional and decorative lighting. • The casita bedroom is great for a weekend stay or and extended visit. • Not to be outdone, this rear guest bedroom has its own private patio. The design for the master bedroom and bath was the last on the agenda to be upgraded. While tucked from the main spaces of the house, the suite makes for an ideal retreat including a large screen TV, a sitting space for two that overlooks the pool and an large scaled art installed on a hand-finished concrete wall. The master bathroom continues the grey tones with amazing tiles that cover the walls and surround the sheet mirror at the twin vanities. 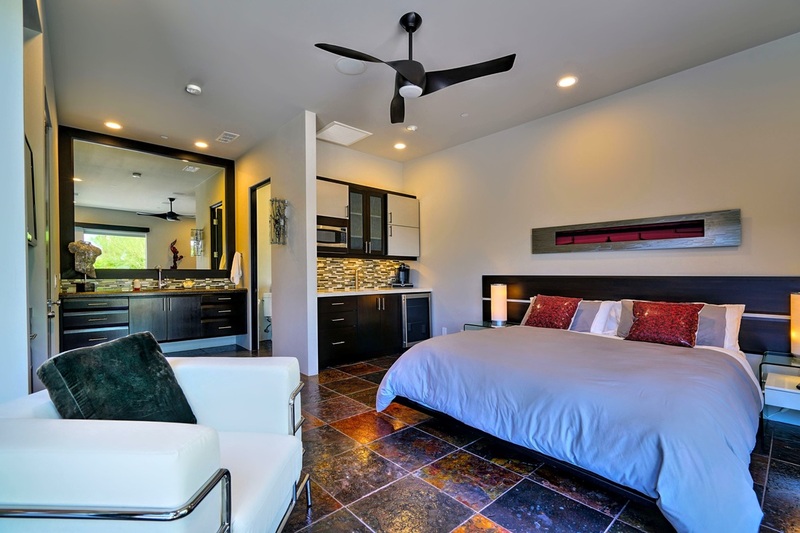 • The master bed is oriented to view the fireplace, wall mounted TV + patio. 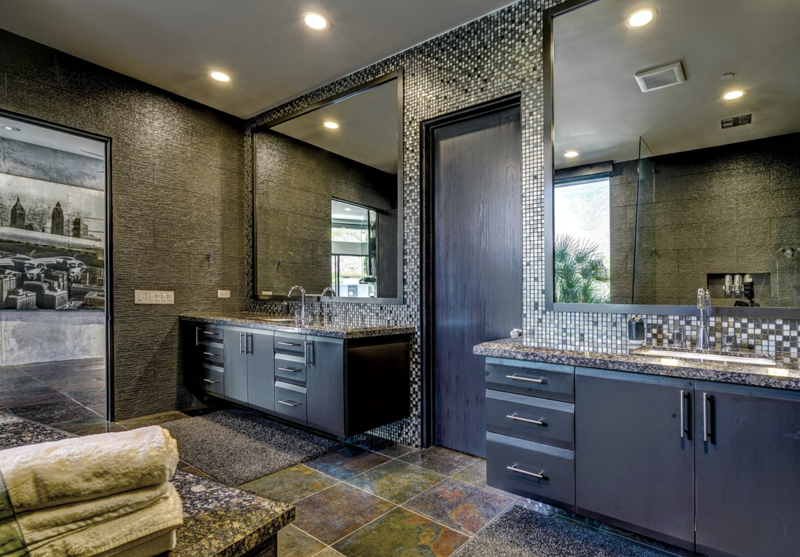 • This bathroom echoes the strength of the bedroom with great tile work. In looking back at the completion of this project, the clients now have a unique residence that is truly about them, their style and their taste. And that is the way it should be. Every house is not a home,...not until the client's taste are expressed in the design.